Have you ever stood in the kitchen fifteen minutes before dinnertime & realized you have nothing started for dinner? Have you ever wished you could spend more time with the family and less with the pots and pans? Break free from the clutches of the kitchen! Have a freshly prepared dinner on the table in 15 minutes or less! Research shows that the average woman has spent 50,000 hours in her kitchen by the age of 45! Not interested in being the “average” woman in that statistic? I wasn’t either, so I developed a system that allows me to have homemade, nutritious food on the table in 15 minutes or less. I call it Homemade Convenience Foods. It saves both time and money and works with my sample recipes as well as your own favorites. Easy for anyone to learn! Homemade Convenience Foods is not once-a-month cooking or frozen pizzas or carry-out burgers, but a simple method that even never-cooked-much-before college kids and newlyweds can easily learn to implement. The Homemade Convenience Foods system is perfect for busy homeschool moms, those who work away from home, and empty-nesters who need motivation to cook for just one or two people. Homemade Convenience Foods even teaches you how to avoid those last-minute grocery runs that cost you so much time and money. With this system, you will always have the ingredients on hand to prepare at least a dozen different menus. Even drop-in guests won’t faze you. 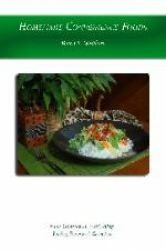 Homemade Convenience Foods is available as an e-book or in a comb-bound print edition. Be sure to order extras as gifts for new graduates, brides, and moms. We’re not talking about using this method for every meal—sometimes you want to fuss and certain recipes won’t work well with this system. We’re talking about a system that will get you through 3-4 meals a week with much less time and hassle, so you can make your specialties on evenings when you are less stressed. Interestingly, when my adult sons come home, they most often request the foods that I can make using the Homemade Convenience Foods system. Homemade Convenience Foods teaches you the rationale for the system and detailed how-to's to make it work for you, followed by lots of recipes to get you started. Best of all, the system is easily adaptable to your family's favorite recipes. In these days of eating out, many young adults have never learned to prepare meals at home. Their idea of eating at home involves carry-out from the Chinese restaurant or a pre-made pizza from the deli. Homemade Convenience Foods teaches inexperienced cooks how to make great food from scratch. It is ideal for those just learning to cook. It makes an ideal gift for a college student, a new bride, or a brand-new mommy. Those who have been cooking for years are enthusiastic about Homemade Convenience Foods, too. They love the time savings and the new method of preparing their old favorites. Homemade Convenience Foods not only saves time, it saves money. No more late-afternoon runs to the grocery store or fast food place to get something for your family's dinner. The system even teaches you how to never run out of anything again using a method that even your children can use. Fewer trips to the store equals more money in your pocket. Be prepared for drop-in guests! Have you longed to show hospitality to those God brings into your path? Have you hesitated to spontaneously invite someone over because you didn't have the ingredients to pull together a meal? Homemade Convenience Foods will teach you how to always have the ingredients on hand to prepare at least a dozen different menus. You will never be caught unprepared again! Downloadable: $5.99; sale price $4.99. Click Add to Cart on this page for this format. Comb-bound binding: $5.99; sale price $4.99 + shipping. Click here to purchase this copy. I'm sure that I am not the only one who likes a break without having to break the budget with going out . . . I will definitely be continuing this method. I'm already experiencing more freedom! I came upon Marcia Washburn on the Homeschool Channel . . . where I heard about Homemade Convenience Foods. The e-book comes up nicely on my Kindle Fire as well as the computer. If you follow her plan, you will have meals that can be fixed anytime in 15 minutes or less. She tells you about the method, what you need, how to do it and also gives you recipes. It is a short e-book but a wealth of information is contained in these 34 pages. I will start using this method to have some extra meals on hand to make in a hurry instead of heading to fast food or take-out! With a husband and 5 grown children I consider myself a seasoned cook, so when I offered to review Marcia’s book I didn’t expect to learn a lot of new things. But being an avid recipe collector and always willing to learn new things, I decided I might be able to add a few things to my repertoire that would give more variety to our meals or a couple of tips that would get me out of the kitchen faster. I wasn’t quite ready for the suggestion of using monkey meat in her African Chop, and I don’t think I’m adventurous enough to try that yet. (She did offer alternate suggestions for meat to use in the recipe, of course.) It certainly did get my attention, though! I came home tired and weary today from several hours of shopping with my 20-something-year-old daughters, sat at my desk, and said, “Now what can I accomplish that won’t require a lot of energy?” Immediately Marcia’s book Homemade Convenience Foods came to mind, and since it was ever so handy on my desktop I got a glass of ice water and settled back to read and relax a bit. I got so engrossed I didn’t stop until I had read the entire book. By the end I felt like I’d just had a nice long chat with Marcia. She writes in a way that makes you feel like she is talking with you, gives instructions in a straightforward way that even the most inexperienced cook could understand, yet keeps it interesting enough for someone who has been around the kitchen a bit longer like me. This book would be the perfect shower gift for a bride-to-be, or a young woman wanting to learn how to set up housekeeping, and even an experienced cook like me can learn a few new tricks. It is available in a paper edition as well, perfect for those gift giving opportunities that are right around the corner. I give Marcia's book a thumbs-up! I’m running a marathon right now. My day starts early and ends late as I homeschool our four boys, care for our baby girl, juggle football and Boy Scout schedules for all the boys, and try to keep up with the housework and cooking. In the fall, there are often nights when we don’t sit down to eat together until 8:30. I hate feeding my family additive-laden frozen pizza and chicken nuggets. A trip through the drive-thru is just as bad for their bodies, and it hurts my wallet, too! When I heard that Marcia Washburn had developed a system to help busy moms get a homemade, nutritious dinner on the table in 15 minutes or less, I was intrigued! She raised five boys and understands that my sons will polish off the ingredients while I cook if I can’t get the meal done fast enough. The truth is, I usually can’t even find all my ingredients in 15 minutes because my pantry, refrigerator and cupboards are so disorganized. Could Marcia’s book really come to my rescue? I was excited to find out! Although I am a veteran in the kitchen, I still found several useful ideas and quick-to-make recipes in Homemade Convenience Foods. I spent a few hours shopping, organizing my pantry, and prepping my ingredients for the week, and then challenged myself to make a week’s worth of lunches and dinners in just 15 minutes or less. Game on! So how did the challenge go? I think I did pretty good, and I give Marcia’s book a thumbs up. My family enjoyed several of the recipes Marcia included in her book. Better still, her systems and tips were easily adapted to my own tried and true recipes. I found that some things I was already doing and that there were some very helpful tips – even for overseas. Since my freezer isn’t that large, I do not make many meals in advance. I found it a great little book. Worth every penny times ten! I have to admit, when I first saw Homemade Convenience Foods by Marcia Washburn advertised with the bi-line, "Have a freshly prepared dinner on the table in 15 minutes or less!" I was ready to Buy Now! Now that I have read and understand the method I can say with sincerity IT IS WORTH EVERY PENNY TIMES TEN! I don't hate my kitchen. I don't even hate to cook. What I do hate is that feeling that comes around at about 4:30 (you don't even need to look at a clock if you have boys, they begin the "what's for dinner?" right on time) of not being prepared to cook dinner. Even if I have remembered to thaw my meat, I may not have thought beyond that, and I still have at least an hour of putting it all together. I am sure you can relate to that! I have tried several methods of cook ahead planning including freezer cooking, once-a-month cooking and a variety of menu planning services. What each of these methods lacked was the variety I would need to appease our wide range of diets. My daughter does not eat meat. My husband is diabetic. One of my children is a very picky eater. I like to watch portion sizes and calories. I never use a microwave. What I needed was a method that would allow me to accommodate a variety of diets, allow me to customize my menu, take into consideration my limited freezer space, be economical, and not take an entire Saturday on my feet of cooking to get it together. I am happy to share, Homemade Convenience Foods does this! Using the concept of stocking your freezer, cupboard, and refrigerator coupled with easy-to-prepare recipes, you are never at a loss for what to cook for dinner. You don't need a stand-alone freezer or walk-in pantry to do this either! Choose your favorite meats, canned goods, and fresh foods and you are in business. I've tried several of the recipes so far and they've all been well-received! No left-overs! I'm SO inspired by this power-packed little book that I am going to do some long range planning with it to REALLY save some money. I'm always looking for ways to prepare healthy meals at home that don't take too long or are budge-friendly. This cookbook helps you make yummy food in a fraction of the typical cooking time. So yes--it saves you both time and money! I found myself saying, "Oh yeah, that makes sense!" and already applying some of her suggestions within the day. Now that is a book worth reading, don't you think? I just wanted to let you know how much I enjoyed your book. You have fantastic ideas that I will be putting to good use! As a busy momma who loves to cook homemade meals, I am always looking for a way to save time in the kitchen. I spend a lot of time there making the healthiest meals possible. If you have children, or even if you just cook for yourself and your husband, you probably would love to learn a way to save time in meal preparation. Homemade Convenience Foods saves both time and money and works with her sample recipes as well as your own favorites. Her ways to save time in the kitchen can easily be used for anyone and for most recipes too. I learned some very valuable time-savers to help me in the kitchen. The book has two sections. In the first section, The Method, Marcia teaches you how to stock your freezer, cupboard, and refrigerator pantries. The second section is a recipes section with ground beef, sausage, pork, kid-friendly, beef, poultry, and bread mix recipes.